Exceptionally accommodating, this six drawer dresser will meet all your bedroom storage needs. 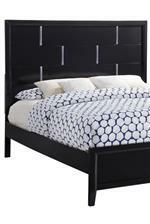 Featuring silver-colored drawer pulls, the dresser features a sleek rectangular design. Perfect for your contemporary or modern bedroom space, this dresser makes a wonderful accent for your home. The 1014 6 Drawer Dresser by United Furniture Industries at AHFA in the area. Product availability may vary. Contact us for the most current availability on this product.